A man has set himself on fire outside the White House, causing a lockdown at the executive mansion in Washington, D.C., officials and witnesses say. His motive was not immediately known but the man is believed to have mental health issues. The incident happened at 3 p.m. on Friday when a man on a wheelchair-type scooter set his outer jacket on fire on Pennsylvania Avenue, outside the North Fence Line of the White House. A suspicious package was found near the man, according to NBC Washington. As a precaution, the White House remained on a partial lockdown at 4:15 p.m. Pennsylvania Avenue was closed to pedestrians and a section of 17th Street was closed to vehicles in both directions. A motive for Friday’s incident was not immediately known, but one official said the man appeared to have mental health issues. His identity has not been released and it’s unclear if he will face any charges. The White House has been the scene of a number of security alerts over the past few years. 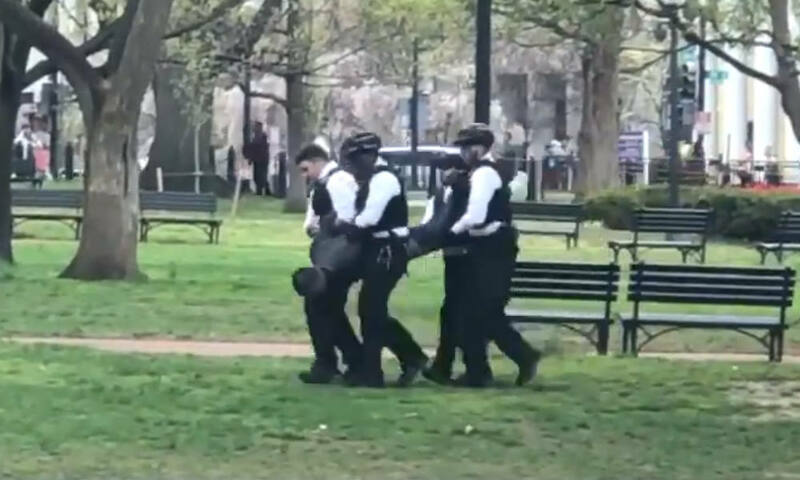 Most notably, in March 2017, a man climbed over a fence at the White House and was able to walk on the grounds for 16 minutes before being taken into custody. He was not able to enter the building itself. And in March 2018, a man committed suicide in front of the White House. If you or someone you know needs help, call the U.S. Suicide Prevention Lifeline at 800-273-8255, a free and 24/7 service that can provide suicidal persons or those around them with support, information and local resources. If you’re in the United Kingdom, call the Samaritans at 116123.